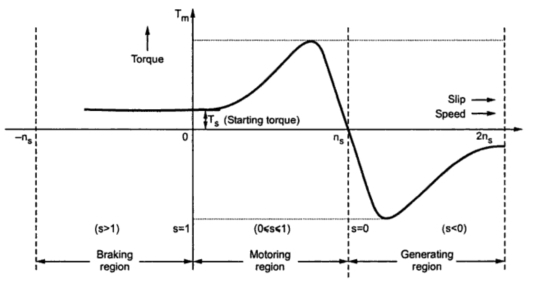 The torque-slip or the torque-speed characteristics of the induction motor are shown in the Fig. 1. The operating mode of induction machine as a generator or motor or braking depends on value of slip s.
When the slip lies in the region 0 and 1 i.e. when 0 ≤ s ≤1, the machines runs as a motor which is the normal operation. 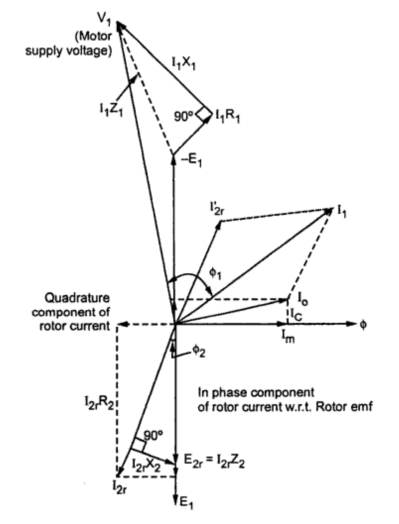 The rotation of rotor is in the direction of rotating field which is developed by stator currents. In this region it takes electrical power from supply lines and supplies mechanical power output. The rotor speed and corresponding torque are in same direction. When the slip is greater than 1, the machines works in braking mode. The motor is rotated in opposite direction to that of rotating field. In practice two of the stator terminals are interchanged which changes the phase sequence which in turn reverses the direction of rotation of magnetic field. The motor comes to quick stop under the influence of counter torque which produces braking action. This method by which the motor comes to rest is known as plugging. Only care is taken that the stator must be disconnected from the supply to avoid the rotor in other direction. To run the induction machines as a generator, its slip must be less than zero i.e. negative. The negative slip indicates that the rotor is running at a speed above the synchronous speed. When running as a generator it takes mechanical energy and supplies electrical energy from the stator. As the speed of induction generator is not in synchronism with the line frequency, it is often called asynchronous generator. Thus when the slip of the induction motor is negative i.e. when the induction motor runs faster than synchronous speed, the induction motor runs as a generator called induction generator. The stator of induction generator must be connected to a voltage source to produce the necessary rotating magnetic field revolving at synchronous speed. When rotor is rotated above synchronous speed and the stator is disconnected from the supply, the generating action will not take place. When rotor of induction machine is driven above synchronous speed, the rotor conductors cut the flux of rotating field in opposite direction to that when it is operating as a motor. The rotor currents are also reversed. 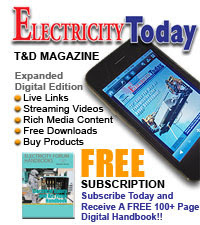 Due to the transformer action, currents are induced in the stator and the induction motor can be runs as a generator. The construction of induction generator is same as that of motor with the difference that the direction of rotation of the motor and a generator is opposite for the same current direction. The action of induction machine as a generator can be explained from the phasor diagram. Consider the phasor diagram of the induction motor on load. Let us consider the speed of the induction machine is less than synchronous speed so that machine takes current I1 from supply. This current I1 is phasor sum of no load current Io and I2r' which is opposite of I2r and referred as reflected rotor current in stator. 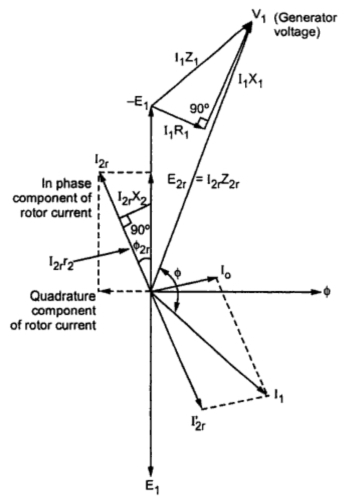 The rotor current can be resolved into two components, one in phase with rotor emf and the other one is quadrature component. Let the real part of above current be denoted by A while the imaginary part of the current be denoted by B. Thus the total rotor current I2r be assumed as A- jB. Now let the speed of the induction machine is increased. With increase in speed of prime mover i.e. of rotor of induction motor slip goes om reducing and hence the rotor current also as it depends on it. Thus I2r decreases. At synchronous speed, it completely vanishes. Hence its opposite current I2r' also vanished and the resultant stator current is nothing but the no load current . The core losses are supplied from line whereas friction and windage losses are supplied mechanically. When the speed is increased further the machines enters in generating region. At zero power factor no power is interchanged between machine and supply lines, But the machine generates power to meet its core losses. When the speed is increased, the current I2r increases in magnitude but it changes the phase. The current supplied by the generator will be then vector sum of Io and I2r' which is reversed in phase as indicated in the phasor diagram. It can be seen that the in phase component reverses while the quadrature component remains in the same direction. The phasor diagram of induction machine as generator is shown in Fig. 2. The current I2r leads the voltage - E2r which is opposite of E2r. The angle between V1 and I1 is more than which shows that electrical power of the machine is negative i.e. it is supplying the power. Thus when the rotor is rotated above synchronous speed with the rotating field remaining in the same direction, then the direction of cutting of rotor is in opposite direction which results in reversal of rotor emf, current and torque. The machine is said to be operating in generating mode. The induction generator is not self excited as it can not generates its own exciting current. Thus it must be always connected to an a.c. supply. Generally it is operated in parallel with synchronous machines. It is shown in the Fig.3. 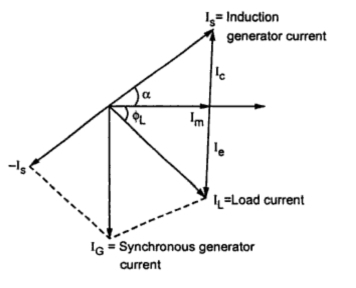 Consider an example of a load which requires a lagging current which can not be supplied by induction generator alone as it supplies leading current. But this current requirement is fulfilled with the help of synchronous generators operating in parallel with induction generator. Consider the following phasor diagram. The load current IL can be resolved into two components one in phase component Im and the other quadrature component Ie. The speed of the induction generator is adjusted in such a way that it supplies current Ic which is leading one. The induction generator current Is is nothing but vector sum of Ic and Im. The synchronous generator which is in parallel with the induction generator must supply the remaining part of load current. For this the induction generator current Is is subtracted vectorially from IL (subtracting vectorially means reversing Is and adding it with IL ). This current is nothing but algebraic sum of currents Ic and Ie. The synchronous generator supplies no power. The total current supplied by synchronous generator is lagging quadrature current. If the load requires a leading current then theoretically the quadrature component of current can be supplied entirely by the induction generator. But for satisfactory operation it should be run in parallel with synchronous generator. If the bank of delta connected capacitors is operated in parallel with induction generator then the reactive power requirement of induction generator is met by capacitors. This arrangements is shown in Fig. 5. The induction generator in this case is said to be isolated induction generator supplying a load. The external voltage source is not required in this case. 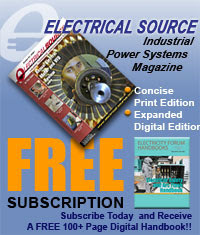 Unlike in synchronous generators, induction generators are not rotating at a definite speed at a given frequency. The speed varies with load as the load is proportional to slip. The frequency of the induction generator is same as the frequency of the line to which it is connected.